When Rachel discovers a journal written by her mother's soul mate - the man she thought was her father - she begins to questio Seventeen-year-old Rachel Ferguson is trying to get struck by lightning. Hopefully it will lead to finding her soul mate, like it did for her mother. And then maybe her mom will be as devoted to her as she is to her lightning strike survivors group. To ask other readers questions about Soulstruck, please sign up. I received a complimentary copy of this book from Sky Pony Press through NetGalley. Opinions expressed in this review are completely my own. Rachael is hoping to be struck by lightning. Her mother was struck many years ago and seems more devoted to her lightning strike survivor group than her own daughter. Her mother also claims the lightning strike enabled her to see who her, and others, soul mates would be. As she refuses to tell Rachael who her soul mate is, Rachael ho I received a complimentary copy of this book from Sky Pony Press through NetGalley. Opinions expressed in this review are completely my own. Rachael is hoping to be struck by lightning. Her mother was struck many years ago and seems more devoted to her lightning strike survivor group than her own daughter. Her mother also claims the lightning strike enabled her to see who her, and others, soul mates would be. As she refuses to tell Rachael who her soul mate is, Rachael hopes that being struck will not only make her feel more accepted by her mother, but give her a glimpse of her future too. She thought she had found 'the one' in another strike survivor - Reed, a boy who turned up out of the blue to her mother's survivor group. But after a short romance, he left her heartbroken and injured from an accident. Between fighting with her best friend, navigating high school crushes, her changing feelings for her friend Jay and trying to uncover the mysteries surrounding her father (who died before she was born), Rachael has her hands full. Unfortunately, although I found the premise of this book really interesting, the way the characters were written were just too juvenile for me. I read a lot of YA books, but the characters in this one just felt childish. The teenage angst and immaturity that radiated from Rachael surrounding all the relationships in her life just let the book fall irritatingly flat. "He could be a serial killer on the run or something" she said after I'd spent nearly every minute with him for two weeks. "Oh, come on"
We kissed, and even though it had been a few weeks, I still couldn't believe I was with him. I was definitely falling in love with him. It was the real deal. Had me sighing and wanting to put the book down due to the silly insta-love theme. I mean, obviously two weeks is SUCH a long time and clearly you know everything about the person. The character I did enjoy was Jay, Rachael's friend who has Asperger's. He was a fantastic character and I really enjoyed his wit and 'realness'. Rachael was pushy and selfish with him. She struck me as a very 'all about me' character and took everything as rejection if she didn't get what she was looking for right away. I wanted more for Jay. I really enjoyed this YA book, it had a different story with the lightening survivors group and Rachel wanting to be a survivor because she wanted to fit in. It was a story about growing as a person and finding out where you fit in, to family, and socially, as a teen this can be a hard thing to do. I really liked Jay's character, I found it interesting to read about a character with Asperger and it was refreshing to have a love interest who was different to the norm. I thought the relationships I really enjoyed this YA book, it had a different story with the lightening survivors group and Rachel wanting to be a survivor because she wanted to fit in. It was a story about growing as a person and finding out where you fit in, to family, and socially, as a teen this can be a hard thing to do. I really liked Jay's character, I found it interesting to read about a character with Asperger and it was refreshing to have a love interest who was different to the norm. I thought the relationships between Rachel and her friends and family were realistic, I felt empathy for her due to her relationship with her mum, and I was glad we slowly found out why her mum was the way she was. NOPE I did not like this unfortunately. Soulstruck was a quick read, that kept my interest but it wasn't a great book. Some parts of it dragged and it took so long to explain how and why Rachel got her injuries - too long in my opinion, since it didn't seem that surprising by the time it was revealed. All in all, this was okay and I'm glad I read it, but it's not a book I'd recommend. Before reading this book, I had no idea what an impact getting struck by lightning has on a person. Of course, I know it could kill a person, but I didn't realize that it causes lifelong health problems and that you need to constantly get checked for symptoms for the rest of your life. There are even support groups like the one in this book, which I had never thought about before. I learned a lot in this book. I loved Rachel. She was very real. She had ups and downs, like a real person. I could f Before reading this book, I had no idea what an impact getting struck by lightning has on a person. Of course, I know it could kill a person, but I didn't realize that it causes lifelong health problems and that you need to constantly get checked for symptoms for the rest of your life. There are even support groups like the one in this book, which I had never thought about before. I learned a lot in this book. I loved Rachel. She was very real. She had ups and downs, like a real person. I could feel her pain, both when dealing with her mom and her boyfriends. I even had tears in my eyes at the end. It was emotional but powerful. I liked how not all of the information was given right at the beginning of the book. It takes a while to learn about Rachel's past, including what her injury was that caused the scars on her legs. Since this information was held back, it made me want to keep reading. One thing that was a little confusing was that the first few chapters alternated between the present and the past, during Rachel's relationship with Reed. It would have been helpful if there was a signal at the beginning of the chapters to show that it was flashing back in time or returning to the present. Once the flashbacks caught up to the present, it continues in the present, so that was only for a few chapters at the beginning. I loved this book! I'll be recommending it for a while. 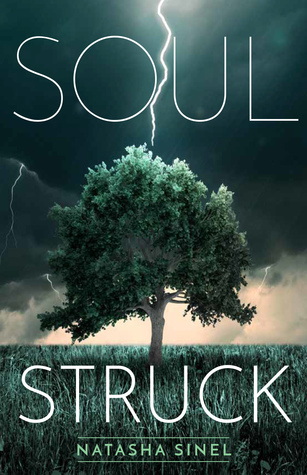 The book Soul Struck, by Natasha Sinel is a captivating tale about a girl named Rachel who has always lived in the company of her mom’s lighting-strike survivor support group. If she gets struck, too, hopefully, her mom will pay as much attention to her as she does to her precious support group. Maybe she’ll even find her soul mate through the strike, like her mom. She’s tried everything. Climbing trees, standing in an open field, but she just can’t get struck. Things seem even worse when her best friend ditches her, her boyfriend dumps her, and she starts to feel like she doesn’t even exist around her mom. One day she discovers a box full of notes from her moms supposed soul mate and Rachel’s dad, and she knows nothing might ever be the same again. The read is an amazing novel for lovers of the enchanted and unusual. I was able to read this ebook through NetGalley! Rachel's mother was struck by lightning and can now "see" soulmates. While the title of this book might make you think that this is the only topic explored, it's definitely not. Rachel is trying to figure out a new crush on an old friend, getting over an ex, typical fights with her best friend, and a slightly strained relationship with her mother. It might seem like a lot going on, but I found it incredibly realistic (okay, minus the lightning stri I was able to read this ebook through NetGalley! Rachel's mother was struck by lightning and can now "see" soulmates. While the title of this book might make you think that this is the only topic explored, it's definitely not. Rachel is trying to figure out a new crush on an old friend, getting over an ex, typical fights with her best friend, and a slightly strained relationship with her mother. It might seem like a lot going on, but I found it incredibly realistic (okay, minus the lightning strikes thing). Rachel's friendship with Serena felt real, right down to the reason for their fight. I loved Jay and the fact that his Aspergers was glossed over; I can understand that some might want to know more about it and him, but it just reminded me that he was more than that. Having only just read The Fix last week, I was so excited to get approved for Soul Stuck, although the storyline is vastly different it didn't stop my enjoyment of the book. I read it in one sitting and I couldn't put it down. Rachel's story of how her obsession with lightning and the relationship with her mother culminated in a great YA novel that explores how we relate to people when we don't always understand that person. It also explores coping mechanisms, and what draws us to them and ultim Having only just read The Fix last week, I was so excited to get approved for Soul Stuck, although the storyline is vastly different it didn't stop my enjoyment of the book. I read it in one sitting and I couldn't put it down. Rachel's story of how her obsession with lightning and the relationship with her mother culminated in a great YA novel that explores how we relate to people when we don't always understand that person. It also explores coping mechanisms, and what draws us to them and ultimately how to overcome them. All in all Soul Struck is a look at families, first love and what it means to let go. I'm excited to read what this author writes next. thank you to Netgalley and the publisher for letting me read & review this for my honest opinion. A really interesting concept for a contemporary ya novel that focuses on friendship, love and family. The romance which develops between Rachel and Jay is pretty believable, it’s not Insta love and all swoon worthy, it’s built more on their friendship and shared awkward moments which I liked, especially when it all realistically goes down hill! The scenery is beautifully described and reminded me of The Rattled Bones by Shanon Parker. A great read for fans of Gayle Foreman and Erin Lange. Thank you A really interesting concept for a contemporary ya novel that focuses on friendship, love and family. Sinel once again displays her confident storytelling skills, her keen ear for dialogue, and her perceptive insights about the complications of young love, as she did in The Fix. Here, the focus is on love and the longing for love - among friends, within family, and within sexual relationships. I especially welcomed Sinel's depiction of a young woman with a sexual appetite who takes the lead her less confident male partners. Rachel Ferguson has a tough life. Her single mother, who was struck by lightning as a teen, seems distant. Her two best friends are changing, and she develops feelings for Jay even as she is “dumped” by her bestie Serena. It is not too angsty, and the teens were likable. This was a comfort read, slow and easy. I thoroughly enjoyed it and appreciate NetGalley and the publisher, who allowed me to be an early reader for my fair and honest review. I could not put this book down. Rachel and her friends were refreshingly real, and the lightning-strike-survivors element was an intriguing way to frame a very genuine and heartfelt drama. Natasha Sinel does an incredible job writing a romance from an empowered girl's perspective. And no spoilers, but I LOVED the ending!! A unique story full of interesting characters about friendship, family, and the bonds that connect us. Seventeen year old Rachel has a lot going on in her life. And none of it seems to be easy. A broken heart, a fractured friendship, a complicated past, a frightening yearning to be struck by lightening...all of it seems to be coming at her at once. Natasha Sinel skillfully balances tender moments with a good dose of heartache in this page turner of a novel. How I’d Describe This Book to My I am a big lover of the “sleepy, summertime beach romance” YA literature genre, so I snapped up Soulstruck when it was available on Netgalley in order to get a jump on the warm weather – and as a Georgia native, summertime comes pretty darn quick here. Unfortunately, this was not a book I could sink my teeth into like I can with many of the other more established “summertime romance” YA veterans – this was an interesting concept, but it ultimately fell flat to me. This book seemed to be interesting, as the plot was unique. However, I could not get into this. Cool theory, but the follow through was disappointing. I finished Soul Struck within 24hrs and was completely hooked from the first page. Soul struck was a girly, fluffy read with a fatalistic twist that makes the reading experience so much more enjoyable! It was a romance that was cynical of soul mates and love. It was a young adult novel that beautifully handles the growth and turmoil young adults go through at some stage. I also was super appreciative of the author for normalising and humanizing the amazing people whom have Asperger's. I've only rec I finished Soul Struck within 24hrs and was completely hooked from the first page. I also was super appreciative of the author for normalising and humanizing the amazing people whom have Asperger's. I've only recently learnt a little about Asperger's due to a friend having it and seeing it portrayed so normally but still accurately was brilliant.